Could it be that the the European Celtic racial streaming originated, at least in part, in the remote recesses of South Asia, in the region of the high mountain range of the Himalaya (“Abode of Snows”)? The following information suggests this may have been the case. In her work, Matter, Myth, and Spirit or Keltic and Hindu Links, Dorothea Chaplain writes: “Cashmere, or Kashmir, is thought to have been one of the principal centres of Serpent worship…. At some time during the fifth century A. D., Doghra was Chief of the Druids in Britain; and it seems not unlikely that his name is in some way connected with the Dogras of Kashmir. 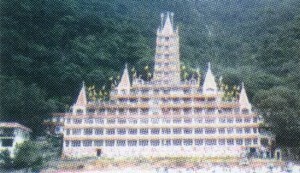 The present Maharajah of Kashmir is a Dogra.” Interestingly, Jesus is said to have visited Kashmir where he was known by the name Isa. The gaelic name for Jesus is Iosa, and an oral tradition records the presence of Jesus and his mother Mary in the Western Isles of Scotland. This may be supported by the placename Eilean Isa (‘Island of Jesus’) which is located off the north west coast of the Scottish Isle of Skye. Close by is an ancient pre-Christian site of worship known as the Temple of Anaitis, dedicated to the ancient Mother Goddess of the Middle East and Asia. 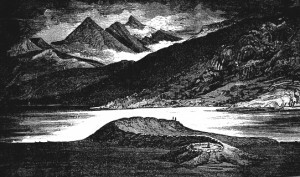 Throughout the Highlands and Islands of Scotland are to be found a number of Annat (Anaitis) placenames which denote sites that refer to a pre-Christian “mother church”. Moreover, Annat placenames, recording sites of religious worship, are also found in Kashmir. Writing about a possible Scoto-Vedic connection, Dorothea Chaplain relates: “The Kayashta, or Scribe caste, in Hindu India, claim descent from Yama, another name for whom is Samana. In Edinburgh the festival of Saman is still observed at a date which coincides with that of Yama; and it is in this famous city that the profession of Scribe, or Writer to the Signet, appears to have been evolved. King Arthur and his Knights of the Round Table of Britain and of Brittany, although allegorical, may also have been actual men. The Lothians and the valley of the Tweed are reminiscent of King Arthur and his retinue; and the great beacon, Arthur’s Seat (Chair or Throne) keeps his name fresh in the memory of the inhabitants of Edinburgh and the surrounding district…. The Grail is the Cauldron of Renovation. It is in possession of the Dagda and Brons (Bran) is the Keeper of it with his son Alain. The Cauldron is the receptacle of the Mother Goddess from which emanate the allegorical gods of the trinity. This is in accordance with the Aryan beliefs of both Kelts and Hindus…. The city of Edinburgh with its famous beacon is surrounded by a halo of romance. Arthur, in Scotland, seems to be identical with Aedh, or Aedhan, the Fair One, Keltic god of Fire. So conspicuous a figure in legend and romance as King Arthur, whose Seat is a landmark all over Edinburgh and far beyond, would seem also to be identified with Edinburgh itself. Is this beacon, now known as Arthur’s Seat, the gadi of Arthur, and one of the spots from which the mystic aidh, or Torch of the Vedas, spread its illuminating rays in all directions for the material and spiritual enlightenment of humanity? 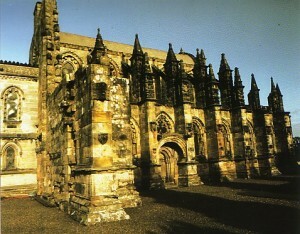 The word aidh in the Vedas is thought by Max Mueller to mean a torch.” Interestingly, a few miles south of Edinburgh is located the famed Rosslyn Chapel which has been likened to a Hindu temple. Dorothea Chaplain further notes: “The island of Coll, the territory of a branch of Macleans, was formerly called Kelis, or Caolas. 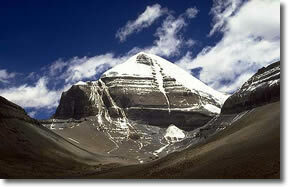 As in Bolivia, we find a name uncommonly like the Sanskrit Kailas, the sacred abode of Siva on the Himalayan Mountains…. 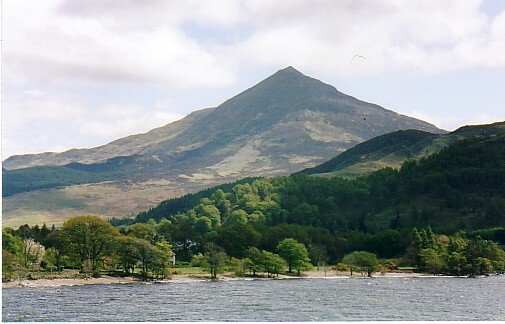 Professor Watson translates ‘Slamannan’, in Central Scotland, as the ‘Upland of Manu’ and ‘Clackmannan’, the name of the smallest county of Scotland, as the ‘Stone of Manu’; both reminders of the great Law-giver who framed the caste system of the Hindus. On a map dated 1731 in the Public Library of Edinburgh it may be noticed that Islay, among the Western Isles of Scotland, is called the Island of Ila; and it is said of Helmsdale and the Helmsdale river in Sutherlandshire that they received their names form ‘Ila’, the name of the daughter of Manu.” She also says: “The name ‘Roy’, as a surname, is frequently met with among Hindus at the present time, and also sometimes in Scotland. Like the English Christian name, it means ‘king’.” And, moreover, “Hindu medical science is expounded in the Ayur Veda (Science of Life), one of the four supplementary Vedas, which is founded on the Rig Veda and the Atharva Veda. Dhanvantari made the declaration that ‘Health is positive, disease is negative’, and, turning to Scotland, we find the same principle expressed in the Gaelic proverb: ‘Man by nature is healthy’.” (Matter, Myth, and Spirit or Keltic and Hindu Links). Dorothea Chaplain also observes: “The Kelts placed pillars on the tops of their hills, many of which are still visible. The pillars were dedicated to the Sun-god, Bal, or Bel, identical with Hu or Huan of Wales, and with Aedh…. Many upright stones, pillars and uncut monoliths are to be seen in India…. Bringing the stone, often from a great distance, sometimes from the Himalayas, no doubt on account of their great sanctity…. The stones are usually roughly cut, like those which one sees so frequently standing in fields in Wales and Cornwall.” This author further says: “In the Mahabharata, written some centuries after the Ramayana, mention is made of Sveta Dwipa, the White Island…. The ‘Old Sage’ instructs Narada as to the situation of the White Island, telling him that it lies to the north-west of Mount Meru, the abode of the gods and the demi-gods in Central Asia…. Scholars have been puzzled by this mysterious White Island, and they do not all take the same view about it. Some think it to be entirely mythical and symbolic, whilst others believe that it has a material significance, and may have been an actual island. Great Britain possesses many signs of the Boar incarnation in the form of symbolic representations, and it seems possible that the sages are referring to Alba. ‘The Isle of Britain’ is called by the Welsh ‘Y Wen Ynys’ – i. e. the White Island. The Holy Graal, or Sanct Greal, is said by Keltic authors to have been brought to the White Isle, and that ‘the White Isle’ is part of England.” (Matter, Myth, and Spirit or Keltic and Hindu Links). The geological rock strata of the West Highlands and Islands of Scotland is believed to be some of the oldest on the planet. Its archaic landscape clearly carries a primeval energy. 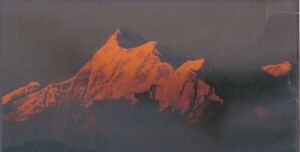 A 19th century writer, Clara Bloomfield Moore, makes the pertinent observation: “The Himalayas, big and grand as they are, must represent mountains whose rise was a thing of a very ‘recent’ date, geologically speaking. This is proved, because we see rocks belonging to a relatively recent age, appearing as part and parcel of their lofty peaks. Very different is the case with the hills and mountains of, say, north-western Scotland. There you come upon peaks of an age well-nigh coeval with the world’s earliest settling down to a steady, solid, and respectable existence. The Scottish hills are the old, the very old, aristocrats of the cosmical circle; the Himalayas, Alps, and the rest, are the new race whose origin goes not further back than a generation, as it were.” (Keely and his Discoveries, 1893). 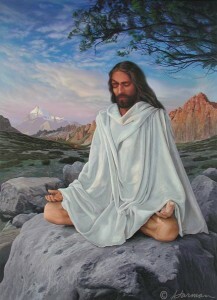 Just as there appears to be a common Celto-Vedic racial heritage, so there may also be an energetic vibrational connection between the high Himalayas and the primeval mountain ranges of Scotland, which drew ascetic Brahmins to the former and Druidic magi to the latter. 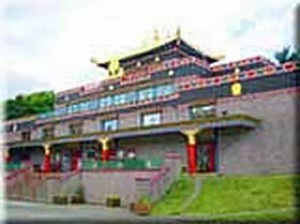 A more recent Celto-Himalayan connection is indicated by the founding in 1988 of the Tibetan Buddhist monastery, Samye Ling, near Eskdalemuir in Dumfriesshire, Scotland. This was subsequently supplemented with the establishing of a Tibetan Buddhist retreat centre on Holy Isle (sanctuary of the Celtic Saint, Molaise, during the 7th century A. D), off the east coast of the Scottish Isle of Arran. What energetic and spiritual implications might the Celto-Himalayan connection precipitate in the future?